The January rally in U.S. stock prices pushed the benchmark up more than 12 points over its Christmas Eve low, rebounding more than 5 percent in the first month of 2019. But that doesn’t necessarily mean stocks are headed into a bull market as the S&P 500 approaches a key resistance line at 2,711. The S&P 500 Index rebound was able to extend through the 2,585-2,630 range lows, but still has a lot of wood to chop overhead. The next confluence of resistance rests at 2,713-2,741. We view that zone and other nearby levels as a critical inflection for the rebound and dividing line between bear market mean reversion versus a resumption of the longer-term bull cycle. In financial chart analysis, resistance lines are the trend lines that connect the high points of a security’s price over time on a graph. 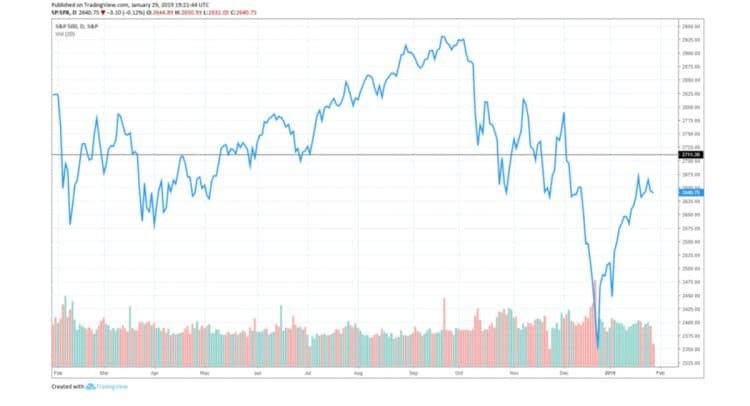 As the S&P 500 approaches the resistance line this week (as you can see on the graph above), the security enters a critical evaluation period with investors watching closely to see what markets will do. Many short term equities traders or any investors looking to make an exit soon from a particular asset will be inclined to sell as the price approaches the resistance line, which is the average of the security’s price highs. A review of history shows the price may have peaked again, and other investors may evaluate the equity as too pricey to buy at that moment. This is why it’s called a resistance line, as it demarcates the point at which historical technical analysis creates market resistance to any further increase in the equity’s price. A BULL MARKET OR A BEAR MARKET? 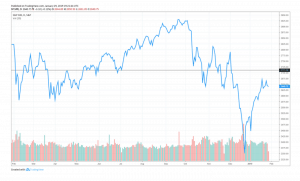 But if market demand for equity on the basis of a number of other potential factors overwhelms the resistance to price growth as the equity approaches the average of historical price highs, and it breaks through the confluence of resistance, it can create a strong buy signal and start another bull run. For JP Morgan’s Jason Hunter, U.S. stocks are back in a bull market if the S&P 500 breaks past the confluence of resistance at 2,713, about 70 points above the price on Tuesday. Actually, the analyst says if the S&P 500 stays above 2511 for the first quarter, he will remain bullish on U.S. stocks. The Federal Reserve raising rates and trimming its balance sheet over a positive outlook on economic growth, the high probability of a U.S.-China trade resolution, and fiscal stimulus from the Chinese government will all influence the near-term direction of the stock market. Given the nature of the macro risks, a definitive breakout will likely correspond with constructive news headlines. Ultimately, the current market is left to determine whether or not the tentative de-escalation of the U.S.-China trade war, shift in U.S. monetary policy, and Chinese fiscal stimulus combine to provide enough stimulus to prolong the economic expansion and U.S. equity bull cycle.